As someone who grew up playing outdoors when I was a kid, with no cell phones, computers, or video games to occupy the mind, the imagination was free to roam in the backwoods of Pennsylvania as far as it was allowed to move us. Frequently my best friend and I would ‘pretend,’ creating various adventures from Saturday morning tv shows, or books we had read. Although we tended to find ourselves on other planets, or fighting for our lives on this one in some post apocalyptic drama, westerns were always a cornerstone in theme of the old cinematic world of showdowns we conceived. 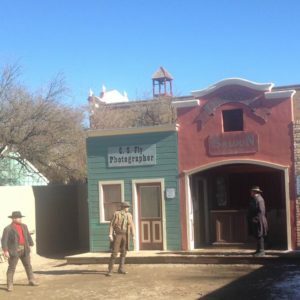 Gunfights, or the ‘high noon’ square-off, has always been one of my favorites, and even though it has been embellished over the years by Hollywood, the one difference in the tale of Tombstone, Arizona is it was not “pretend,” but very real in the events that unfolded in 1881’. 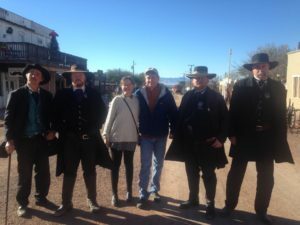 As we walk the very streets where Wyatt Earp, the Earp brothers, Doc Holiday and “The Cowboys” lived and breathed, there is a sense of a time when men were hardened by their truths, struggling to survive in them, placing a high value on the pride of life as it was felt by them. One look perceived as threatening could send another man sideways, and in the old west where justice was served from the hip, any movement towards the handle which dispensed it, almost certainly meant death or close to it. 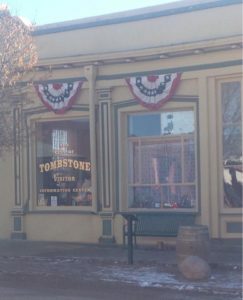 Tombstone was not unique in this environment, Dodge City, El Paso, Lincoln, San Antonio and others also were rampant with old west justice, but many of the other gunfighting towns never reached the fame that the O.K. Corral did. 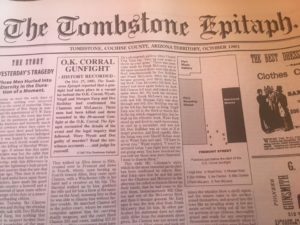 You might think Wyatt and his brothers were famous beforehand, or the cowboy faction they were at odds with had some national news, and although the territory was under distress from the lawlessness, not many people had heard of a place called Tombstone until that fated day of the gunfight. Why? 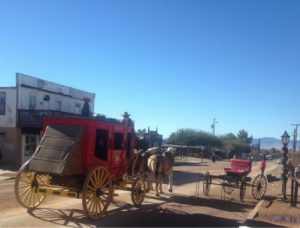 A little known fact besides Tombstone being a very wealthy mining town, silver had transformed the little town, bringing it some modern advances like the ‘telephone.’ Moments after the fatal shooting took place the confrontation was being transmitted across the country, and overnight, the Earps, Doc Holiday, the ‘Cowboys,’ and Tombstone would become famous. 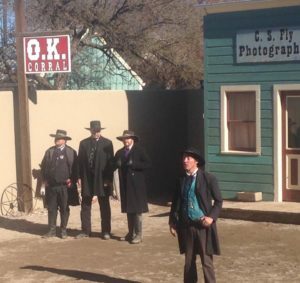 Walking the streets of Tombstone today you will find yourself immersed in a fun loving crowd of actors, shop owners, and tourists who have a curious passion for the mystery of the old west. People who wonder at a time of legends, and a hardened yet fulfilling existence, where words spoken were enforced by bullets, and attention to detail might save one’s life. Although we live in different times, as a species we still crave this edge, its in our mythos of humanity, the story of the ‘hero’s journey,’ and the ‘villains’ of our darkness that accompany us. We need fulfillment, adventure, and challenges, to explore the depths of what it means to be alive. And when we hear of such stories, or another time where such took place, we question ourselves, curiosity coming to the surface, and we open our heart to greater potential of what life paths we are walking. It’s in our nature to strive for the ‘better,’ gazing in reflection on how we may ‘improve.’ But sometimes its not as difficult as it may seem. Watch any child pretending, playing by themselves or with others, and you will glimpse the world we have come here to explore in our innocence. A virtual playground of imagination raised up in the dust of bodies, all that we may feel, express, and experience ourselves more deeply. So as today unfolds, let us remember to live as we have come here to be, feeling all that we feel, meeting life wherever we are at, setting out with our imaginations of different times, places, and cultures that might challenge desires once asleep in us. And when we hear of stories from a time past, or wonder how others might live, if it sparks something in us, let us fan the flame of our divinity, without judgement or opinion, but meeting our own hero’s journey with all the innocence of the heart. May it be so, so it is.??? ?